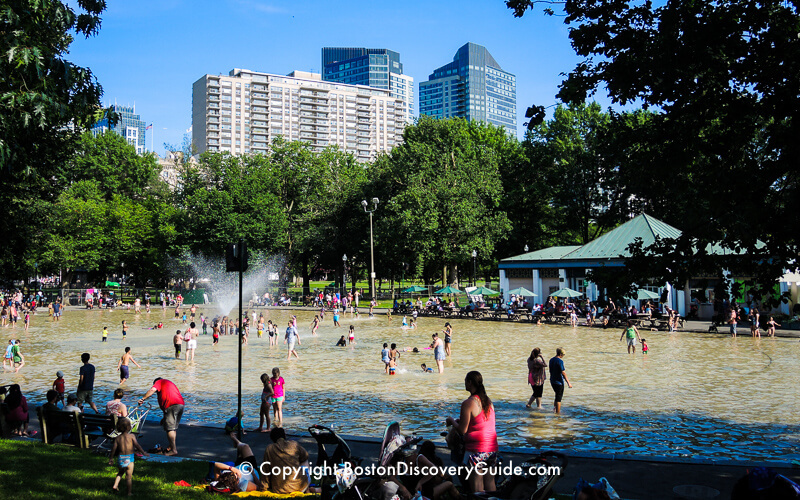 Boston Common's 44 acres of lush green space form the heart of the city. 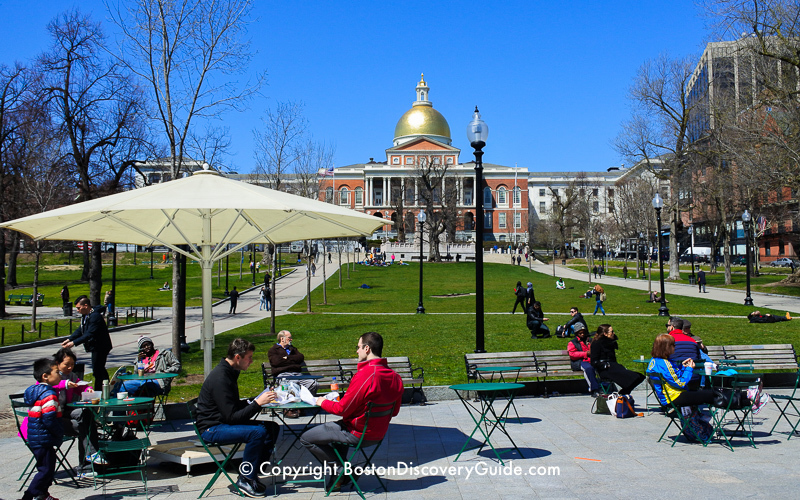 In addition to being the first stop on the Freedom Trail, the Common is where you can enjoy some of the city's most popular activities and events. 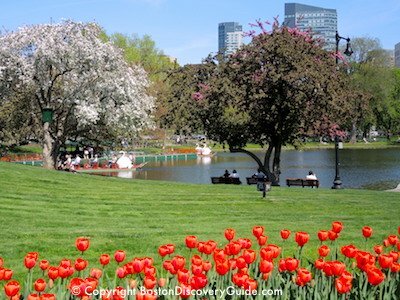 Sometimes called "The People's Park," Boston Common has a little bit of everything: ice skating in the winter, outdoor theater on warm summer nights, tennis courts and baseball fields, memorials and monuments, a carousel, running paths, a tourist information center, and even its own graveyard. 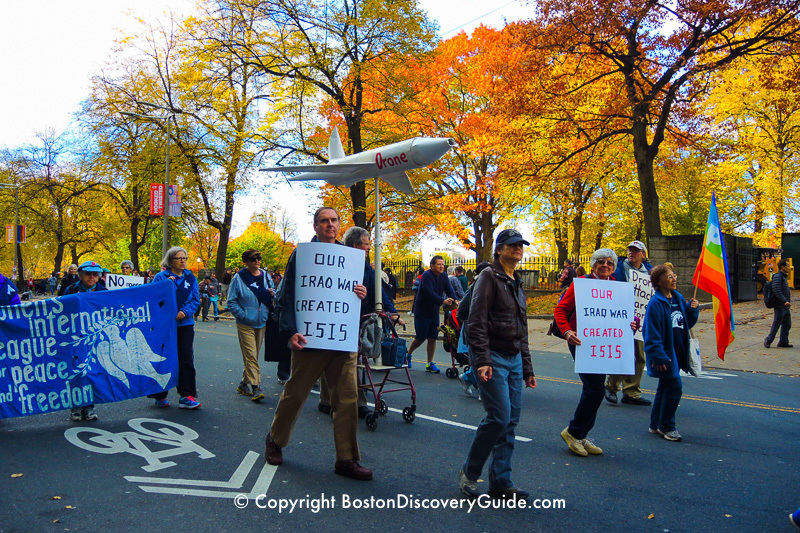 Boston Common has long been the site of protests, rallies, and celebrations. You can even celebrate New Year's Eve here as fireworks launched from the ball field light up the sky. 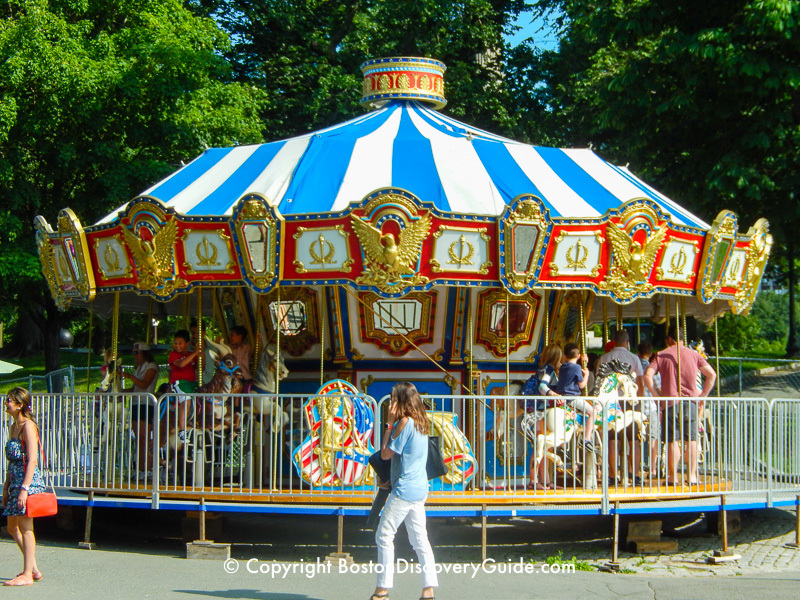 Here are our top suggestions for 15 fun things to do, see, and enjoy on Boston Common. 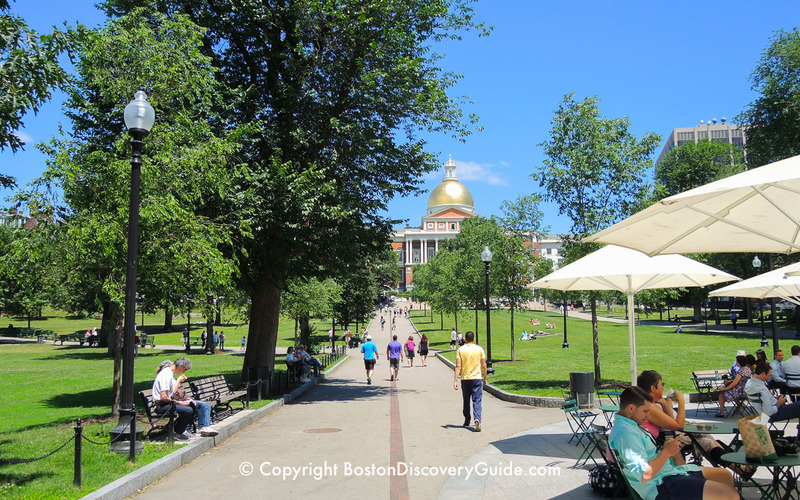 The Freedom Trail, a 2.5 mile red path past the city's most historic parts sites starts on Boston Common where the area's first English settler, William Braxton, built his log cabin and fetched his water from a nearby spring back in 1625. After the Puritans arrived in 1630 and bought the land from Braxton, they used it as a common pasture for grazing their cows for almost two more centuries - although it did double-duty as the place where they also publicly executed heretics, witches, Quakers, criminals, pirates, and other undesirables throughout the 18th century. After British troops occupied the city in 1768 to quell the troublesome Colonials, they set up camps across the Common. On April 18, 1775, the day before the American Revolution officially began, about 700 Redcoats started their journey to Concord to seize weapons hidden by the Patriots, which triggered Paul Revere's famous ride across the countryside. 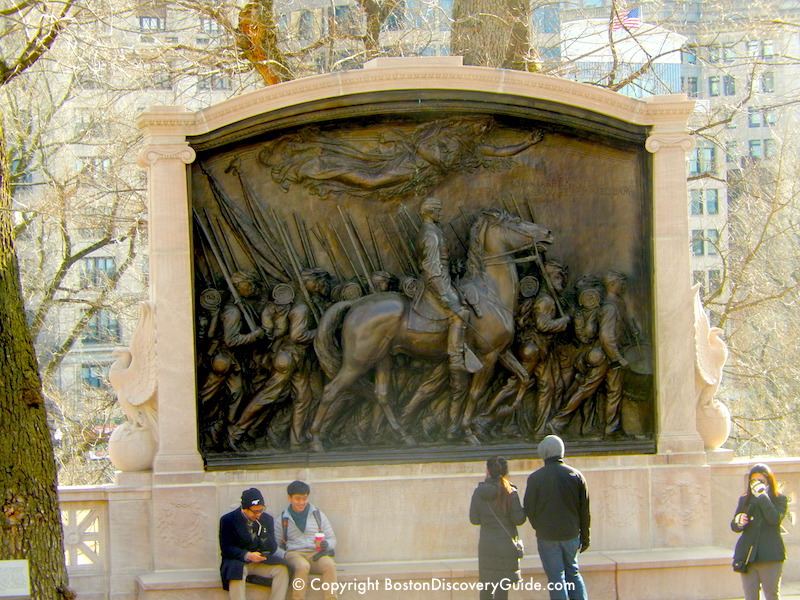 If you take one of the popular Freedom Trail tours, the guide will tell you all of these historic events as you walk along the Trail's red path. Frog Pond really did used to be a shallow pond, but it is now lined with concrete and is only a few inches deep. It does triple-duty as an ice-skating rink in winter, a splash pool during the summer, and a tranquil oasis with lovely fountains in spring and fall. 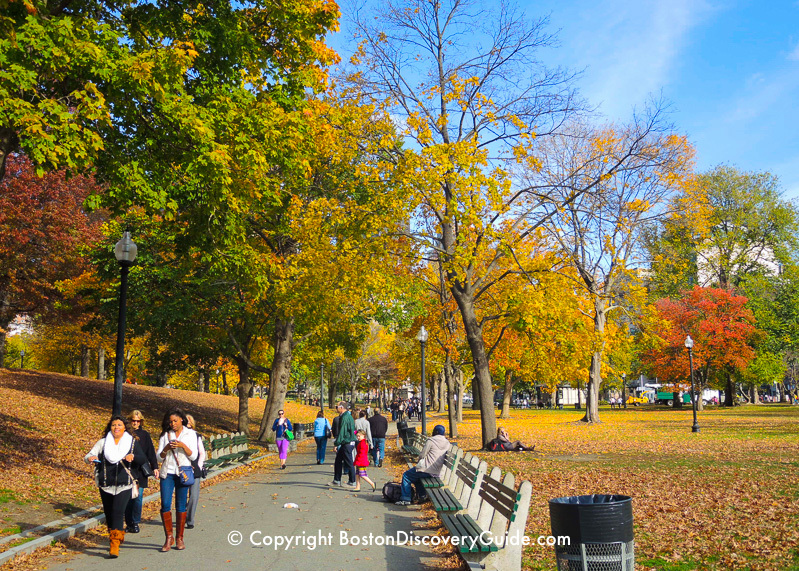 A stroll through the Common from late September through early December gives you an easy way to enjoy fall foliage without leaving the city, thanks to the many different species of trees changing color over a long period. 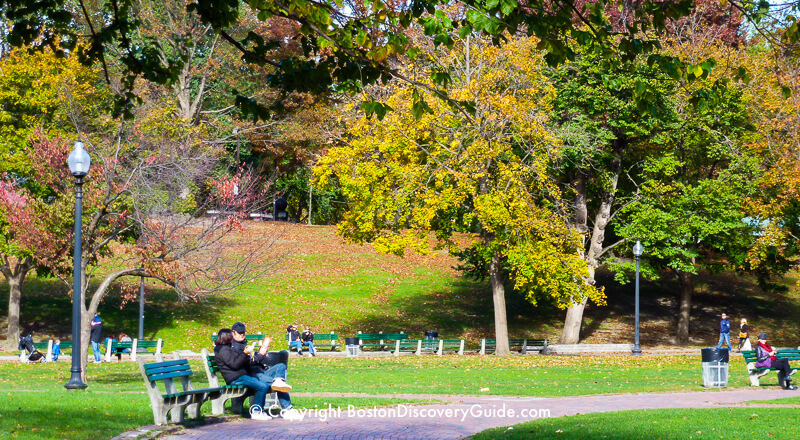 For even more variety, cross Charles Street on the west edge of the Common and enjoy fall colors and fall-blooming roses in the Public Garden. 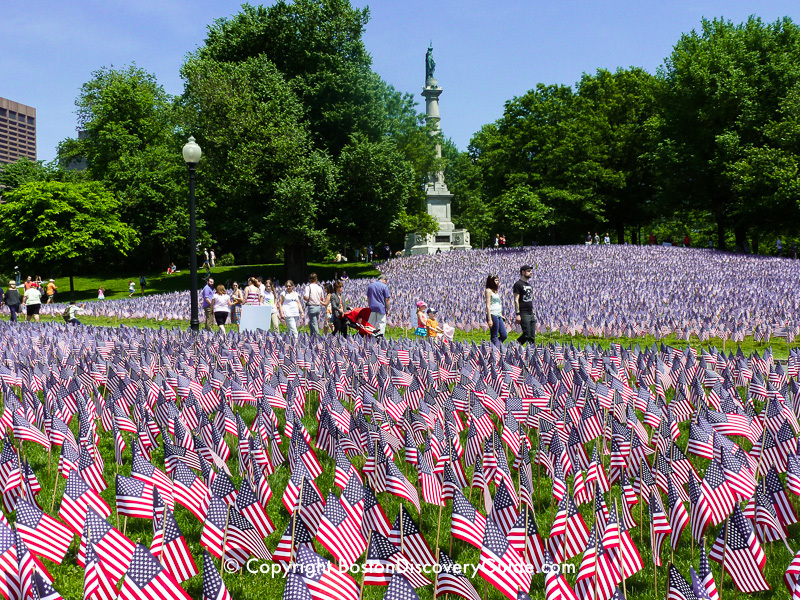 Every Memorial Day, the Massachusetts Military Heroes organization plants a Garden of Flags in front of the Soldiers and Sailors Monument on Boston Common to commemorate each of the Massachusetts service members who have given their lives to defend the United States and our freedom since the Revolutionary War. The 37,000+ flags usually go up a few days before Memorial Day and remain in place for a day or two after - find exact dates on our May events calendar. 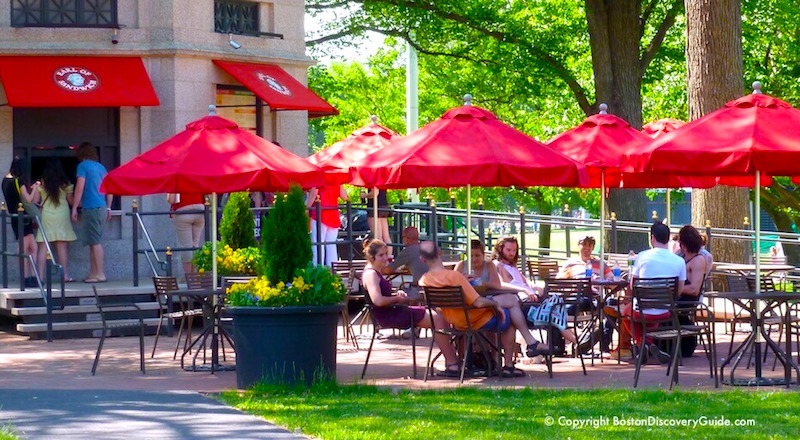 Hang out with friends, family, or just a good book - plenty of benches, chairs, and tables make this easy to do. Bring a picnic! Lie on the grass - on warm, sunny days, there's nothing better. Kick around a soccer ball, or join one of the pick-up games - look for them on the open grassy fields near the Charles Street/Beacon Street corner. Play tennis - the courts are near the Boylston/Tremont corner. Play baseball, if the ball fields aren't occupied by regularly scheduled games. Dozens of monuments and memorials scattered around the Common provide a glimpse important important as well as almost-forgotten aspects of Boston history. 1. 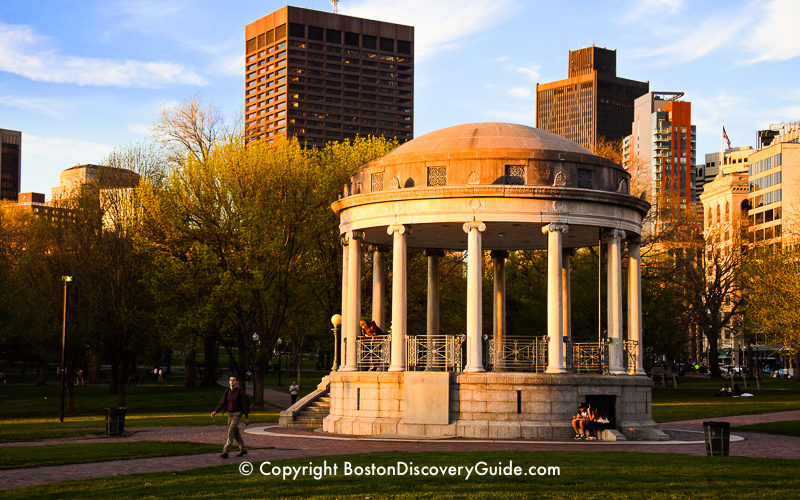 Boston Common is always called "Boston Common" or "the Common." Never add an "s" to Common unless you want to sound like a non-local. 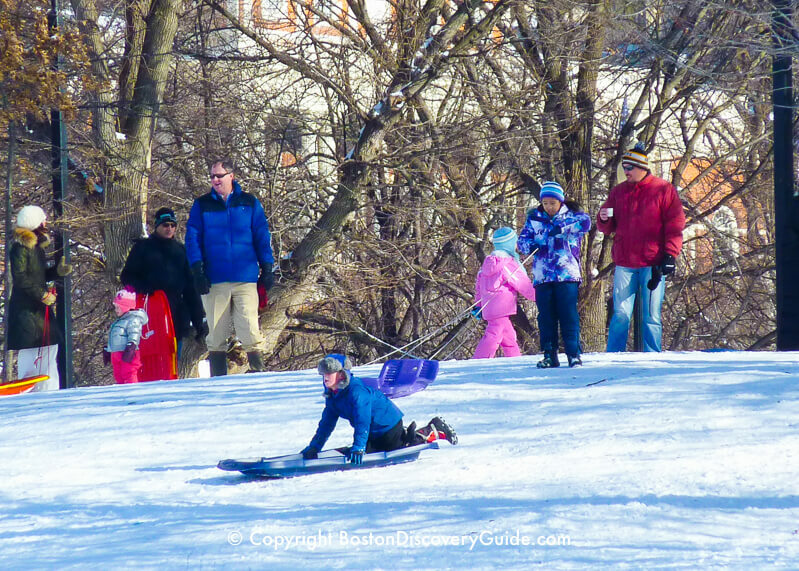 A fresh snowfall, sunshine, and a sled - nothing is better than this in Boston in the winter! Although the Common doesn't have steep hills, the gentle slopes are perfect for a few hours of sledding. 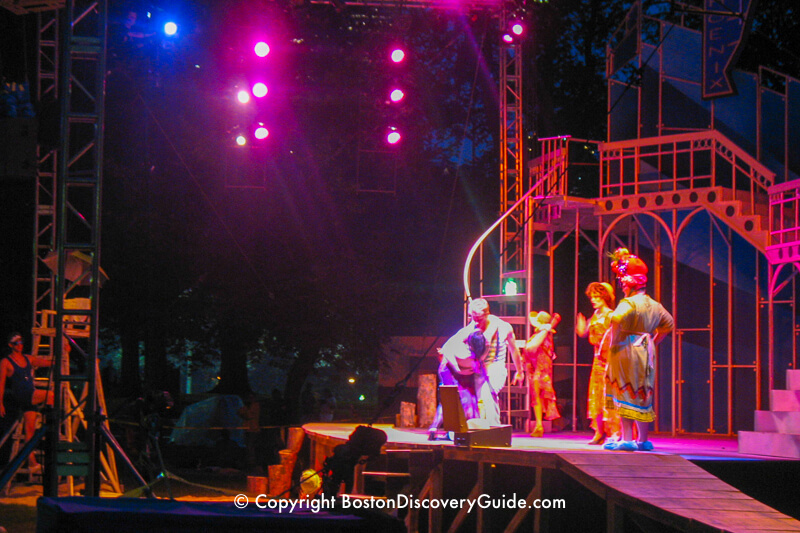 A sloping area near Parkman Bandstand gets transformed into a theater under the stars when Shakespeare on the Common puts on a special production every summer. Bring a blanket or low folding chair, and get ready for a magical evening. 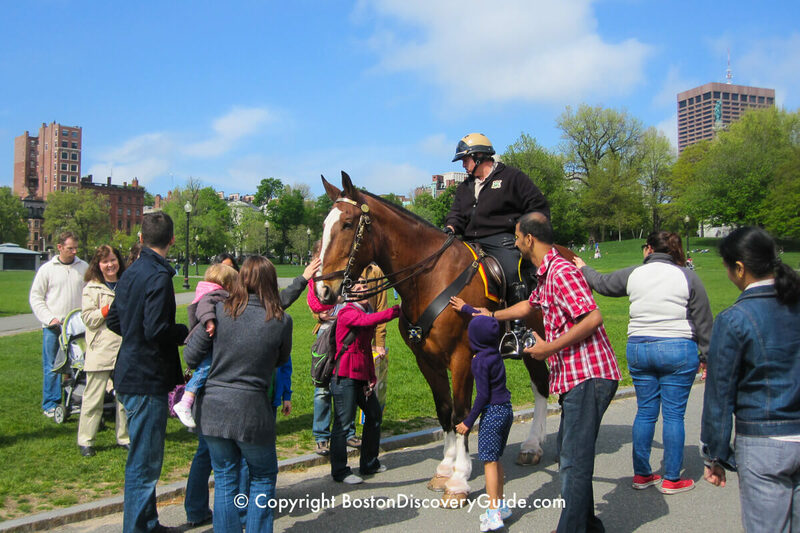 The six horses (and the Park Rangers who ride them) attract happy crowds whenever they pause during their patrols of Boston Common. There's no doubt that the Boston Park Rangers Mounted Unit is one of the Common's most appealing sights - but they're also part of what makes this park safe because they give the Rangers a sweeping view high above the crowds. The moment an ice skater on Frog Pond takes a bad fall, or someone faints due to summer heat, you'll see a horse and Ranger gallop over to help. Want to watch the horses having lunch? During good weather, you'll often see them munching on hay around noon in their special fenced-in space behind the Visitors Information Center. Tucked away on a small rise near the Boylston Street side of the Common is the Central Burying Ground, established in 1756 when Boston's other graveyards began to run out of room. Gilbert Stuart, remembered today for his paintings of George and Martha Washington, is the most famous person interred there. 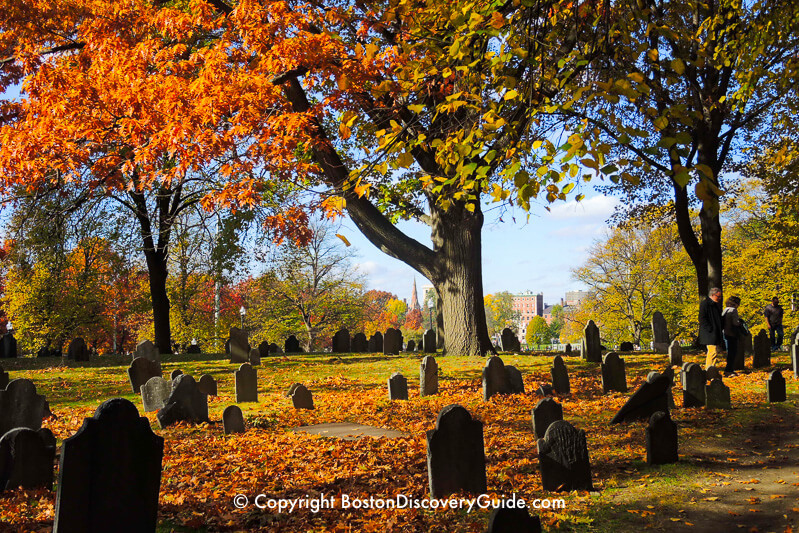 T he cemetery also contains the remains of Tea Party and Revolutionary War Patriots, as well as British soldiers who died from disease during the British occupation of Boston and from wounds received during the Battle of Bunker Hill. Getting ready to pop the big question, and looking for a memorable spot? If you don't get the answer you wanted, a 10-minute walk will take you to sports bars near TD Garden, where big screens and cold brew may help take your mind off your sorrows. Boston Common is the site of several special New Year's Eve celebrations: sparkling ice sculptures, a free ice skating show on Frog Pond, and an evening firework display. 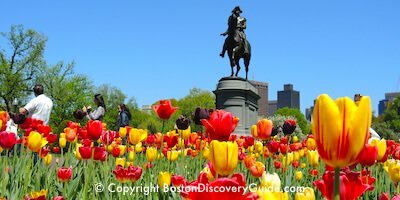 Need a free Boston map or other tourist information? 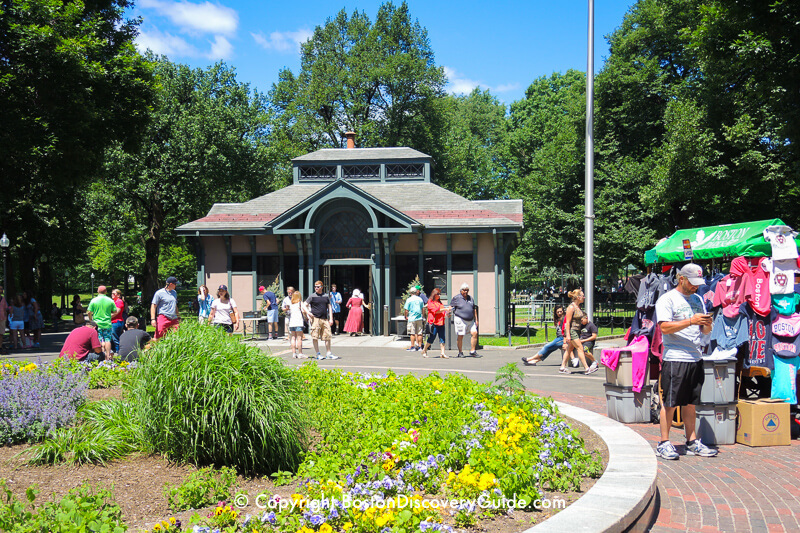 Stop by the Visitor Information Center on the Common near Park Station (opposite West Street). To get one of the free maps, you'll need to ask for it at the counter. You'll see lots of maps on the racks near the door, but those are not free. 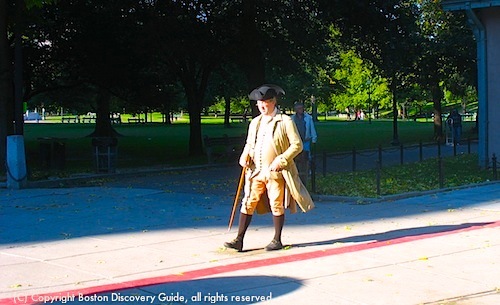 The free map shows everything you'll need, including Freedom Trail site locations. More about where to get free Boston maps. You can find three tasty places to eat (not counting vendors selling hot pretzels and lemonade) without leaving the Common: Earl of Sandwich (seasonal) not far from Frog Pond and the tennis courts, food trucks from late morning - early afternoon on most weekdays near Park Station, and Frog Pond Café (don't pass up the Belgian waffles if they're available), usually open daily. For more choices, if you're near the Beacon Street/Park Street corner, head down Beacon Street toward the waterfront. In the first couple of blocks past the intersection, you'll pass several pubs and a Japanese restaurant - you'll find very good casual food at all of them. Or, if you like contemporary Italian fare and love out-of the way "insider secret" type places, walk down Bowdoin Street to Grotto (37 Bowdoin; dinner every evening and lunch on Monday-Friday). 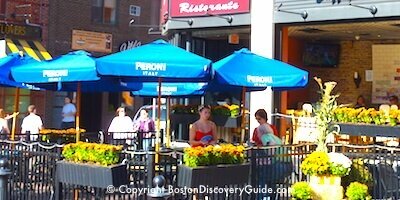 From the Tremont Street/Boylston Street corner, walk up Boylston Street (away from the Common) where you'll find Fin's Sushi & Grill (62 Boylston) or walk a block or two further to Chinatown for a huge number of options (here are a few suggestions). Or, keep walking down Tremont into the Theatre District to Abby Lane (253 Tremont), which looks like a stylish American comfort-food spot but is headed by Chef Jason Santos, who packs amazing flavors into old favorites. From the Charles Street/Beacon Street corner, walk down Charles Street into Beacon Hill, where you'll find even more choices.